SEOUL, August 24, 2011 – Samsung Electronics Co. Ltd., a leading mobile phone provider, today announced a new naming strategy for its GALAXY range of smartphones. The creation of the new naming system is marked by the release of four new GALAXY smartphone, the GALAXY W, GALAXY M Pro, GALAXY Y and GALAXY Y Pro, all of which run on the powerful Android 2.3 Gingerbread operating systems. Samsung has created a new and simplified system of naming its smartphones, focused on its ever-expanding portfolio of industry-leading Android devices. The naming structure will organize and group all devices into five classes, identified by a single alphabetical letter. Devices will then be further designated by an additional indicator which will identify specific functionality. “As Samsung continues to innovate, our goal is to provide consumers with an experience uniquely tailored to their needs. We have introduced steps to ensure users can simply identify the device designed to deliver the perfect experience for them,” said JK Shin, President and Head of Samsung’s Mobile Communications Business. • “R” (Royal / Refined) – Premium category models, a combination of power, performance and productivity for the individual who wants to be defined by the technology they carry. • “W” (Wonder) – High quality, strategic models, perfect for those seeking a balance between style and performance. • “M” (Magical) –High-performance models at an economic price-point. • “Y” (Young) – These are entry models or strategic models for emerging markets or a younger audience more sensitive to price. Compact but with a full range of features and allowing the ability to stay social on-the-go, the GALAXY Y is an ideal device for younger consumers. Seamless multitasking is enabled thanks to the device’s powerful 832MHz processor. 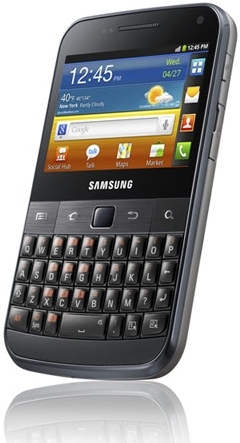 The GALAXY Y includes Samsung’s Social Hub, allowing users to stay connected with their online social circles. Equipped with Samsung’s TouchWiz User Interface, the GALAXY Y delivers a simple and intuitive experience. Additionally, the inclusion of SWYPE facilitates speedy typing. The GALAXY Y is available in a variety of colors ensuring it can fit with anyone’s style. An optimized, intuitive touch screen interface allows an accessible and intelligent experience, while users are able to work on the go thanks to ThinkFree mobile office, enabling a variety of Office documents (Word, PPT, Excel and PDF) to be edited from the handset. Productivity is enhanced thanks to the combined power of touch screen and QWERTY keyboard inputs, enabling smooth navigation with efficient and professional input. WiFi Direct also allows faster transfer rates, allowing content to be shared quickly.